Stuck for play activity ideas? The solution is simple, and FREE! It's a website run by a qualified teacher and mother-of-two, Melitsa Avila. Go to the Play Activities website, and subscribe to their newsletter. You will receive daily free fun, educational activities to try at home with your kids. Many of the activities are creative and craft-based so would make fantastic party activities too! I've just discovered a new distraction called Twitter. It took a little while to understand the concept, but it's a different kind of social network - rather like Facebook without the extras. If, like me, you like reading everyone's Facebook updates, then you'll probably like Twitter, because, on the surface, that's all Twitter is - updates! It may sound simple (and indeed it is), and you may wonder, what's the point in logging on to Twitter to tell anyone who cares to follow my updates that I'm just about to put the washing in the dryer? Well.........that is a very valid point, but it only takes a while to realise the power of Twitter lies in whose updates (or tweets, I believe they may be called) you follow, and how many people you can, through social networking, get to follow you. As a website owner, I can use Twitter to direct people to my special offers, competitions, new products, this blog, or indeed share an inane pondering as to how long exactly it will take my 4 yr old son to finish his soup - he's still slurping away, approximately 43 minutes since I presented it to him for lunch. As a follower, I can get immediate updates on the news by following the BBC newsfeed, learn business news and tips from Business Groups, keep up to date with friends and colleagues, and anything else that interests me. Simple it may be, but strangely addictive too! All you need to do is choose to follow somebody - then you can see who they are following, and choose to follow them if you wish. You can also search for other users, and invite people over so they can follow you. Why not give it a try? If you choose to follow my tweets, you'll find me here: http://twitter.com/FunkyD. 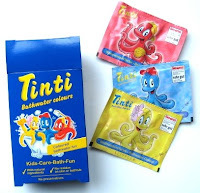 We're pleased to offer a new range of Tinti Bath Products. You can buy them as single items, in packs or in pre-filled party bags. The first product is the very popular colour changing bath tablet. In packs of 9, and in 3 colours (red, blue and yellow), they are made from natural sources, contain no preservatives, soap or SLS, and kind to young skin. Simply drop one of them into your bath, watch as it fizzes about and turns the water into a different colour. The colour doesn't fade at all, and leaves no residue on the skin or bath. You can even mix the tablets together, so children can learn as well as having fun in the bath! Our particular favourite is a combination of blue and yellow - they fizz individually, and gradually the different coloured waters mingle and creat a green bath - we call it the "Shrek" bath! 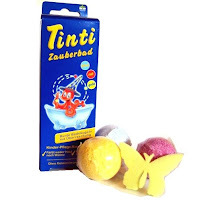 The other product is the Tinti Magic Bath Ball. This is more than a bath bomb. Made with natural ingredients, free from preservatives and SLS, these bath bombs are simply magical. Drop it in your bath and watch them fizz about, turning the water a different colour (red, yellow or blue). Once it's dissolved, a hidden capsule will be revealed - what does it contain? In a pack of 3, we found an octopus, a butterfly and a giraffe! Fantastic fun. They come in packs of 3 or in pre-filled party bags. Funky Dory Party Bags has had a recent face lift, and we couldn't be more pleased with it! We asked Katie at Pink Iris Logo Design to come up with a retro, vibrant feel, and we think she's hit the perfect note. Even our beloved frog logo had a bit of a "touch up", and we think he looks so much the better for it! To mark the new image we launched a "name the frog" competition. After many, hugely imaginative entries (some of our favourites being Funky D' Frog, Fergal, Fester, Jazz and Flash) we decided to call him (or her) Dory. It was quite logical as he's become an integral part of the logo.